Weaving together the latest apparel designs and technology, with the rich culture of Nepal, while continuing to provide steady education and meaningful employment to Nepalese communities. MODESTO, CA — Sept 20, 2018 — Purposeful apparel, designed for the global adventurer, Sherpa Adventure Gear’s Fall 2018 line is mindfully crafted for function and performance, on every adventure. 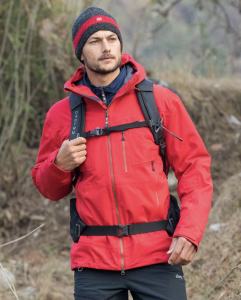 Receiving Mountain Weekly’s “Environmentally Friendly Product Award,” the men’s Lakpa Jacket was named after our athlete Lakpa Rita, the first Sherpa to climb all the 7 summits. The ultimate mountain layer, the Lakpa Jacket is constructed with a Polartec® NeoShell® laminated 3-layer stretch and is detailed with unique Nepalese designs. NeoShell is the most breathable waterproof fabric on the market, while still being wind-resistant. Super-lightweight and ultra-durable, the perfect three-seasons outer layer, the new Asaar 2.5-Layer Jacket (available in both men and women) is constructed with Himaltec® laminated 100% nylon four-way mechanical stretch, a double ripstop with clear dot pattern laminate and a dry touch print on the fabric backing. The first outdoor adventure pant made with Dyneema® (6%) — a fiber 15 times stronger than steel and 30% lighter than traditional nylons and polyesters — the Gurkhali Pant is lightweight and soft enough to wear to the office, super sturdy for the bike commute there and provide durability while car camping and cragging when the weekend hits. With classic 5-pocket jean styling and reinforced with heavy duty stitching and bartacking at critical seams for your most active days, these pants are made to resist abrasion on and off any trail ventured down. With four-way stretch and supportive shape “bounce-back” without multiple washes, the women’s Kalpana Hike Tight is the go-to tight for a big trek, an easy weekend around town, and everything in between. With a body fabric constructed of 9.5 oz. 76% Supplex® nylon, 24% spandex, the Kalpana Hike Tight is over 25% softer than standard nylon tights, wrinkle and abrasion resistant and features dual side zip panel pockets to secure essentials. Featured in Outside Magazine’s 2018 Winter Buyer’s Guide, the bluesign® approved Sonam Jacket is made with Polartec® Thermal Pro® with Repreve® (recycled plastic bottles). Warm enough for the mountain — it’s unique texture enhances performance by trapping air and retaining body heat — and stylish enough for the street, the Sonam is the ideal mid-layer for all cold-weather pursuits this season. Available in both men and women. A core part of who we are and what we do, our handcrafted knit hats are a winter essential and idea for every destination. Taking approximately 3 hours to make one hat — using 100% non-mulesing wool and Himalayan-inspired designs — their construction provides social stability and financial independence to many women in Nepal, by providing jobs that don’t conflict with Nepal’s culture, while providing income to those that might not have opportunities otherwise.Through this steady employment and quality working conditions we hope these beautifully crafted hats help build a brighter future for hundreds in the community. Also made in Nepal, in the ancient city of Kirtipur, our sweaters employ over 50 people in the country each year. A Sherpa classic, the Kirtipur Sweater, which won a Gold award at ISPO, is a mesh of handcrafts and new fabric technology. The 100% lambswool sweater is lined with PrimaLoft® Black Insulation Eco, a synthetic insulation that offers warmth, softness, and lightweight comfort and contains 60%-post consumer recycled material. With each sweater taking over seven days from start to finish, our unique designs capture the timeless traditions and textures of the Himalayas and bring vital income to families. Sherpa Adventure Gear was founded in May of 2003 by Tashi Sherpa, as a living memorial to the unsung heroes of Mt. Everest. For decades, climbers have always been grateful for having a Sherpa companion on the treacherous slopes of the Himalayas. It is the Sherpa who makes the route, carries the load and sets the ropes to the top and back. In this spirit, Sherpa Adventure Gear seeks to honor the legendary high-altitude climbers by creating adventure gear that earns their praises. Sherpa Adventure Gear is focused on providing economic and social stability to the people of Nepal through steady employment, quality working conditions and educational opportunities for future generations. Likewise, a portion of every sale benefits the empowerment and education of children throughout the region through the Sherpa Adventure Gear Fund. For more information, visit sherpaadventuregear.com.